Join special guest Brit Clark, Asst. Director of the Conrad Mansion Museum for a slide presentation. The 13,000-sq-ft mansion along Woodland Avenue was completed in 1895. 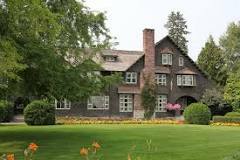 The Charles E. Conrad Mansion is a historical Victorian era shingle-style Norman mansion located in Kalispell, Montana. It was designed by the noted Spokane, Washington, architect Kirtland Cutter. It was the home of Charles E. Conrad, a late 19th century shipping magnate and early pioneer of Kalispell. In addition to shipping, over the course of his career Conrad was involved in a number of different businesses including real estate, banking, cattle ranching, and The mansion sits in the middle of an entire city block with three stories and 26 rooms and included electricity and an elevator, state-of-the-art features for the turn of the century.